Think Big is Telefónica's way of helping young people in Europe to be better prepared for their professional and personal futures through developing entrepreneurial skills and specifically digital skills by “learning by doing”. The goal of the programme is twofold. On the one hand, to promote the entrepreneurial spirit among young people and provide them support to enable them to realize an idea. And, on the other hand, to to give visibility to their endeavours and projects, so that other young people may get inspired thus creating a multiplier effect. Think Big is one of the best examples of how Telefónica puts into practice its mission that claims that possibilities of the technology should be open to everyone, and that Telefónica should contribute to removing barriers between people and their possibilities. This program is about innovation and entrepreneurship and is aimed at young people aged between 13 and 25. It seeks to contribute to the development of a more entrepreneurial and more digital Europe, with the idea that young people are the foundation of social change, through leadership and responsibility for their own projects. Since 2010, the program has supported more than 6,500 projects and a total of 11,200 young people in six European countries (Spain, Germany, Slovakia, Ireland, the United Kingdom and the Czech Republic). Over 5,000 Telefónica employees are involved in the program every year. 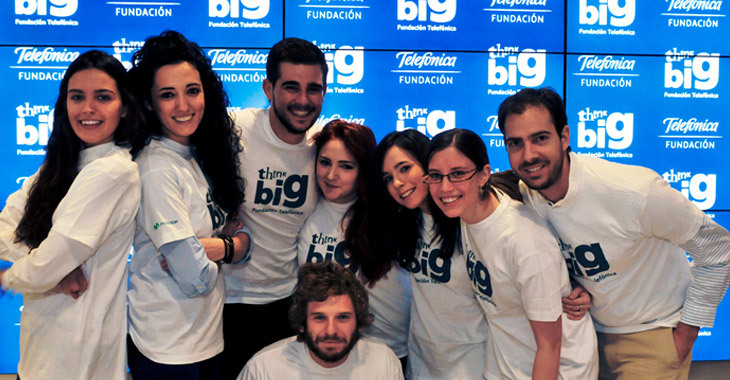 Think Big is funded by the Telefónica Foundation and implemented with the support of the Telefónica Company in each country, and more than 200 NGO partners thorough the European region.